Hold on to your bananas - the Minions are back! The Minions are back, back for more! More chaotic catastrophes! More astonishing (mis)adventures! More manic mayhem and definitely more banana related mishaps and misdeeds! And more bananas. Lots and lots of bananas. 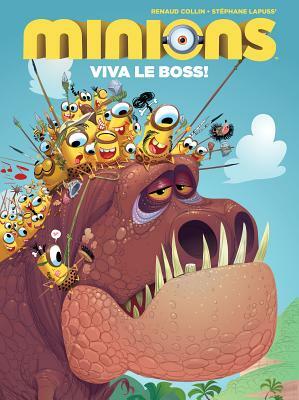 Join Stuart, Kevin, Bob and the rest of the Minions In the days before Gru as they travel through history in heroic sagas ripped from the annals of legend, or at least rumour, as they continue their epic search for their perfect leader. The Belgium writer Lapuss has worked for several of Europe's most successful comic magazines, including Tchô! - where he wrote a medical comic strip called The Infirmary, explaining the functions of the human body to children. In 2005 he started working for Spirou on his new satirical series, Screenshot. His other work includes writing Le Piou, Superblagues and Scooters for Delcourt, and Damned De La Route for Bamboo. He has also written comic biographies of the Beatles and Michael Jackson.